Bright, hearty and complex! 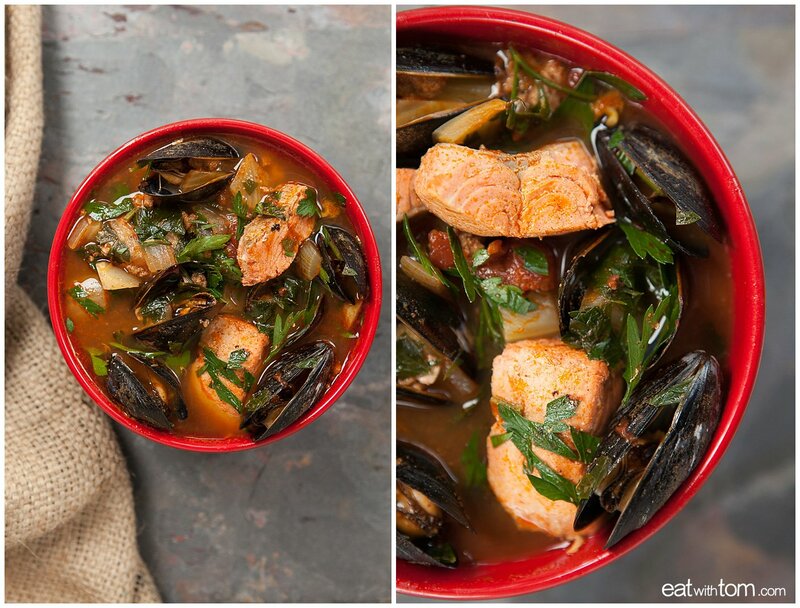 This salmon and mussel seafood stew has a delightfully fresh tangy flavor and a deep savory finish. Although it is a warm stew, it is perfect on a summer evening with a glass of white wine. Feel free to make this with whatever seafood is available in your area, this dish is versatile. 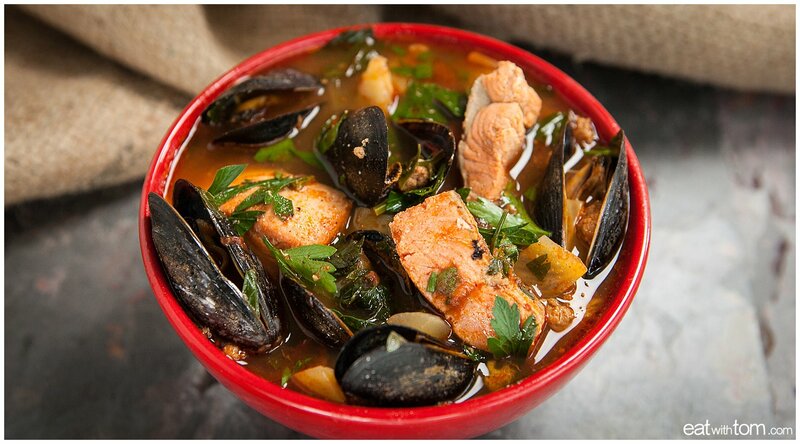 I have made it with a variety of fish and seafood ingredients, but have landed on Coho salmon and mussels as my favorite. The Coho Salmon has a strong flavor that is perfect in the stew and tends to hold together nicely. Don’t forget the lemons! 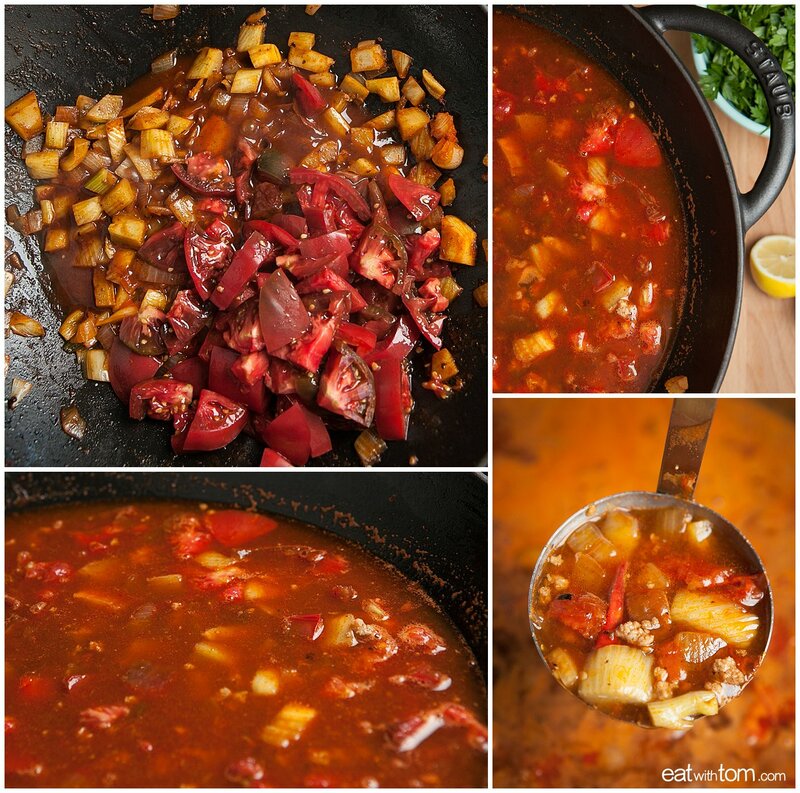 The stew develops a wonderful depth of richness that is brightened up with the zestiness of the lemon juice. 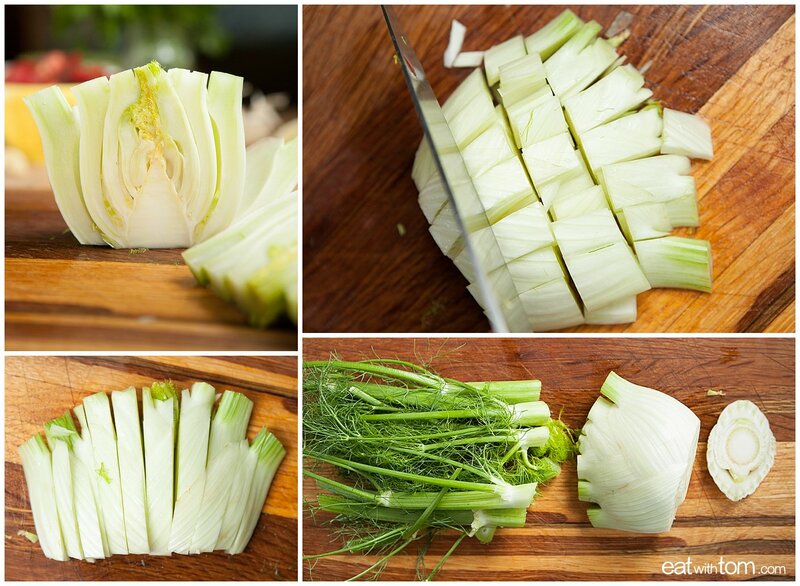 Prepare fennel by cutting off the fronds and bottom. Dice the fennel similar to how you would an onion. I ended up with the fennel pieces a bit large in this recipe, requiring a few extra minutes of cooking time. 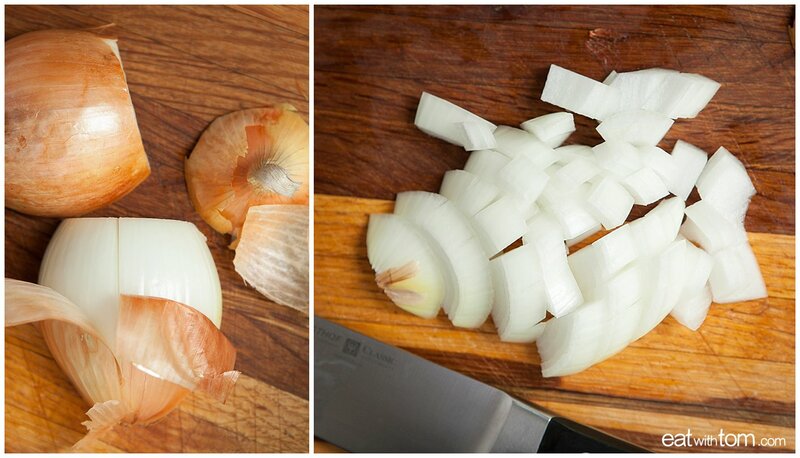 Fennel is more rigid than onions and will need a little longer to sauté. Set aside. Cut the onions in a rough dice to maintain a nice bite in the stew. A super small dice will just disappear after the simmer. 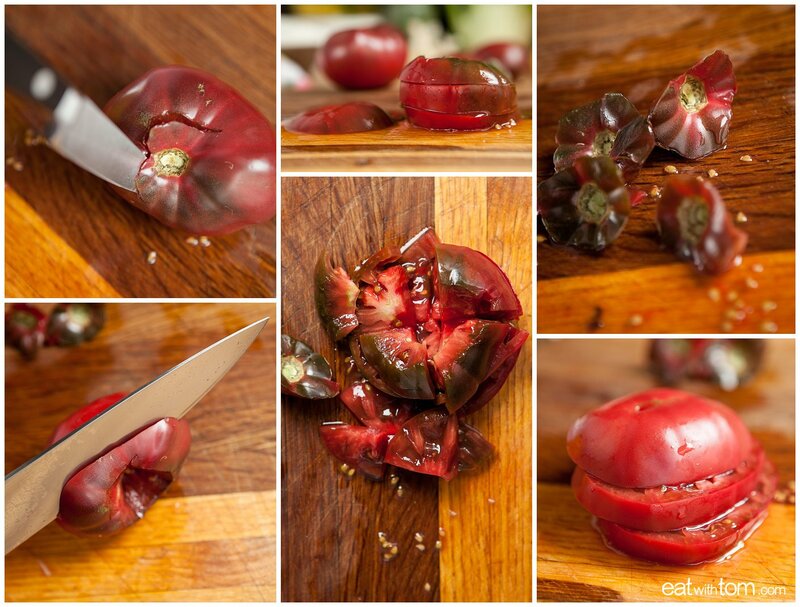 Chop the tomatoes into ¾ in chunks. First cut out the core, turn on its side, and slice. Take all the slices, except for the “hat” and turn upside down. Now cut down to chop into pieces. Cut the “hat” separately into similar sized pieces. Repeat with all tomatoes. Chop the parsley and reserve for the final step. 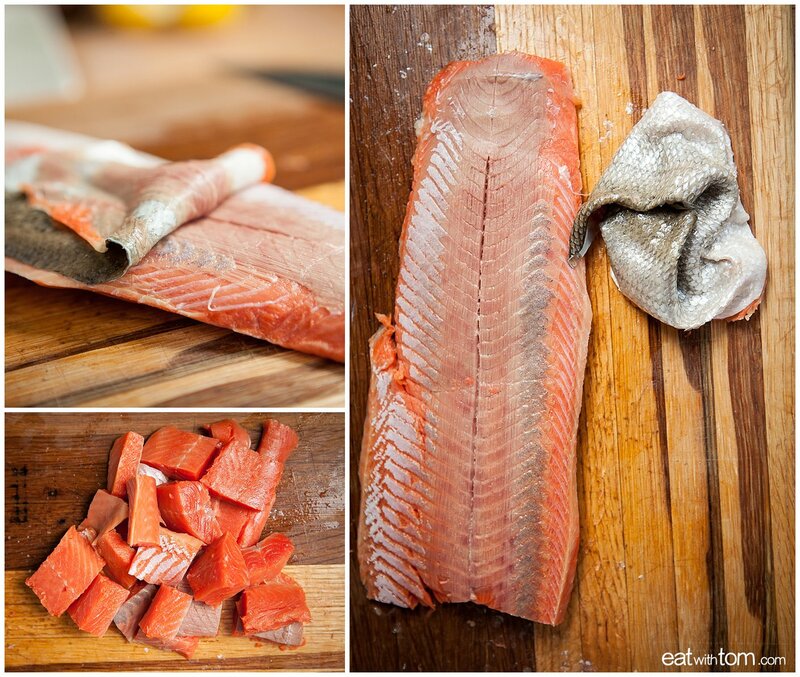 Prepare the salmon by first removing the skin and chopping into large chunks, approximately 1 in by 1 in. Store in the fridge while making the broth. Remove the chorizo from the casing by creating a slit down the side to open and chop loosely to break up. Set a heavy bottom deep skillet or dutch oven (I used the cast iron Staub Wok here) over medium heat and add the olive oil. Add chorizo and brown gently for 3-5 minutes. 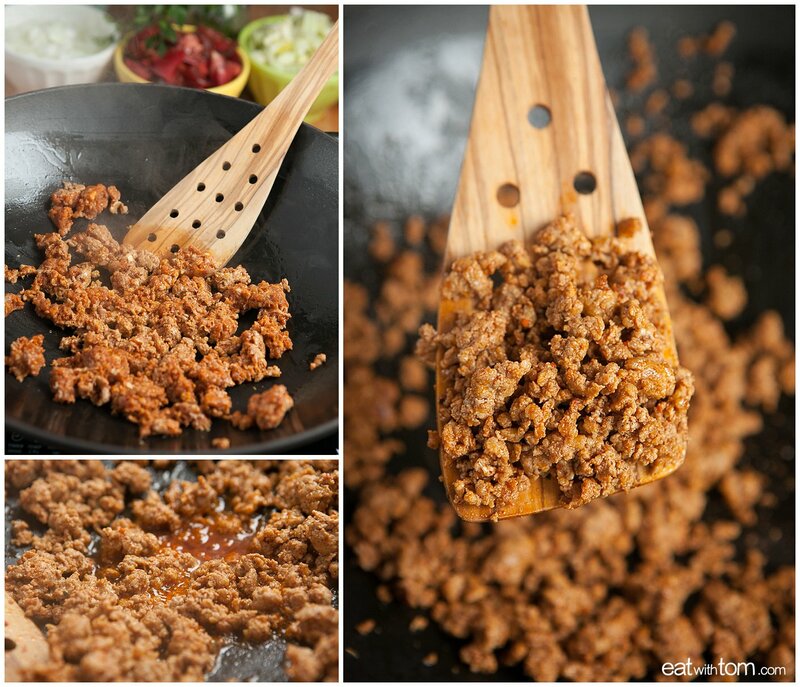 Once the chorizo is browned, remove to a plate and reserve drippings in the pan. 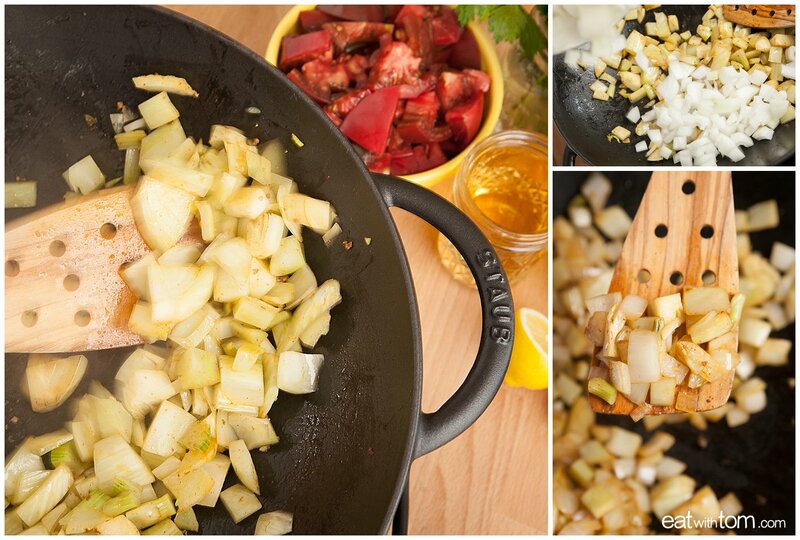 Add fennel to pan and sauté over medium heat for 5-7 minutes or until it begins to soften. Add the onions and sauté an additional 5 minutes. Both fennel and onions will have a slightly translucent appearance. Add the tomato paste and crank up the heat to medium high. 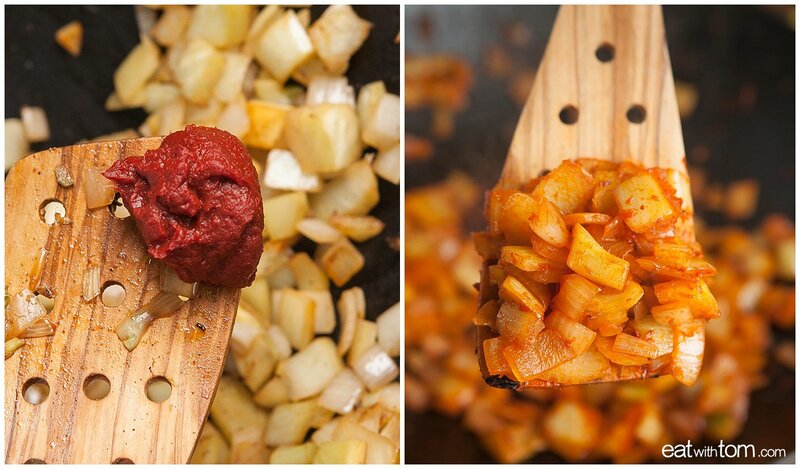 We want to caramelize the paste to help build the amazing depth of flavor that makes this dish soooo wonderful. Stir frequently for 3-5 minutes or until the paste begins to brown. Add the wine to deglaze the pan and turn the heat down to medium. Allow to simmer until most of the liquid has evaporated. 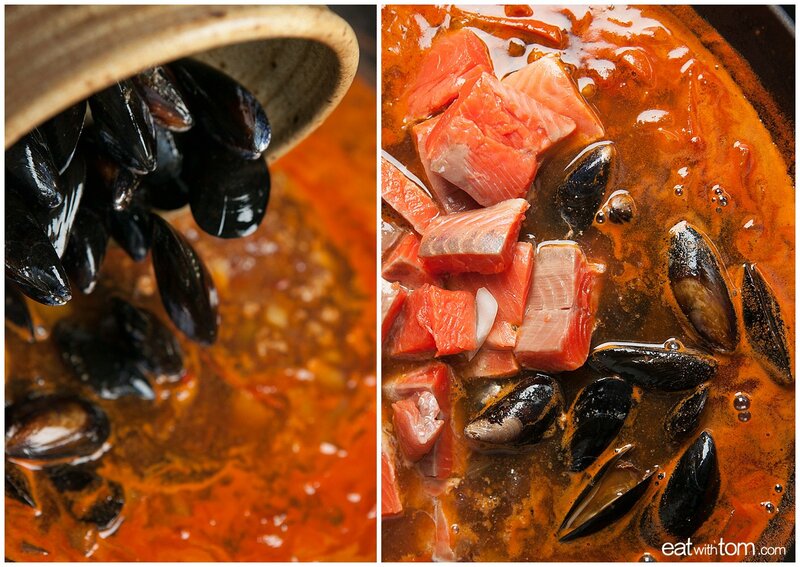 Add the mussels and salmon to the pan and cook for 2-3 minutes until the mussels open and fish begins to flake. This goes quick! Add the parsley and squeeze the juice of one lemon into the stew. I always like extra lemon and often add another ¼ to ½ of a lemon to my bowl. 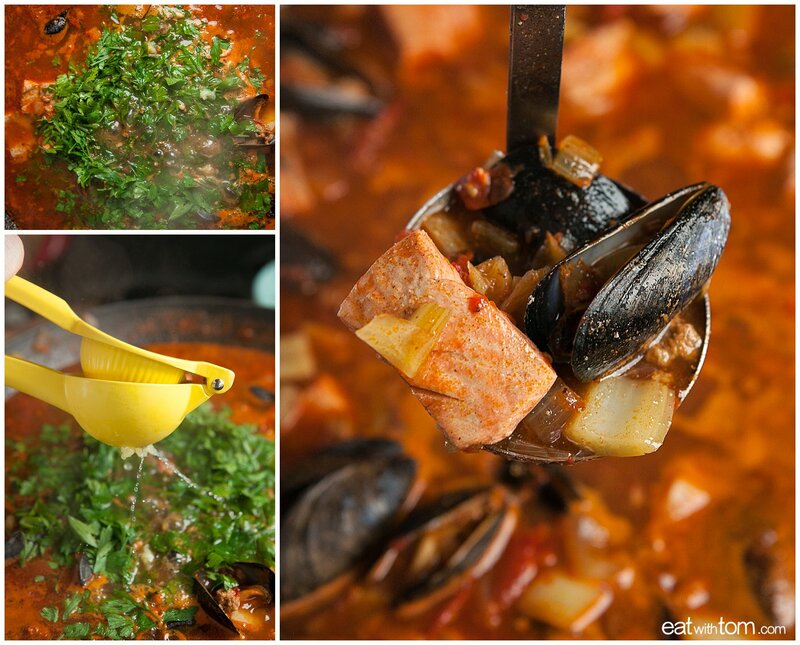 The lemon is crucial and adds an awesome brightness to the flavor of the stew. Remove the chorozo from the casing by creating a slit down the side to open and chop loosely to break up. Add the parsley and squeeze the juice of one lemon into the stew. I always like extra lemon and often add another ¼ to ½ of a lemon to my bowl. 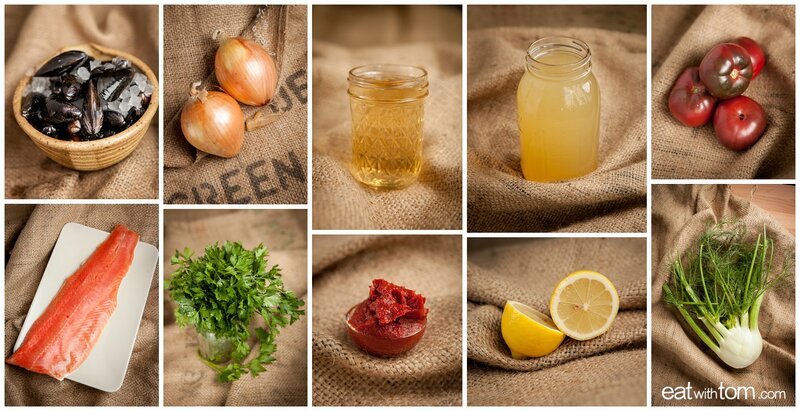 The lemon is crucial and adds an awesome brighteness to the flavor of the stew. I would love to make this but what do you think if i substituted clams for the mussels? I don’t care for them but this recipe sounds great! Love your photography too! I have not tried the dish with clams, but I imagine the flavor would be comparable. 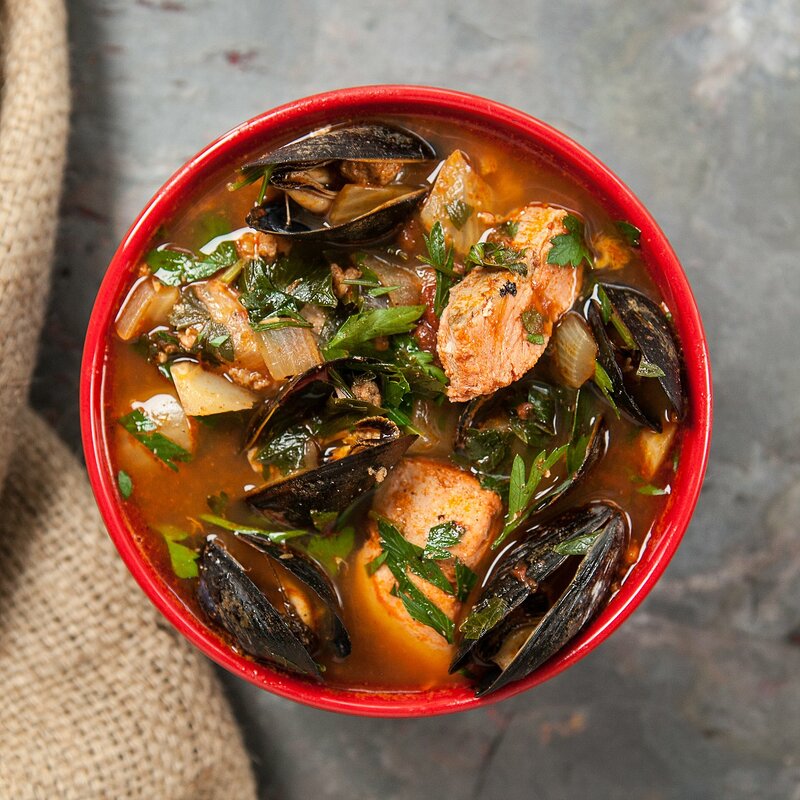 The mussels add a distinctive seafood flavor and should cook similarly. Let us know how it turns out! Thanks for the comment and compliments!